Carson’s mechanical tone siren units combine the classic Mechanical tone with a “Stutter” air horn. 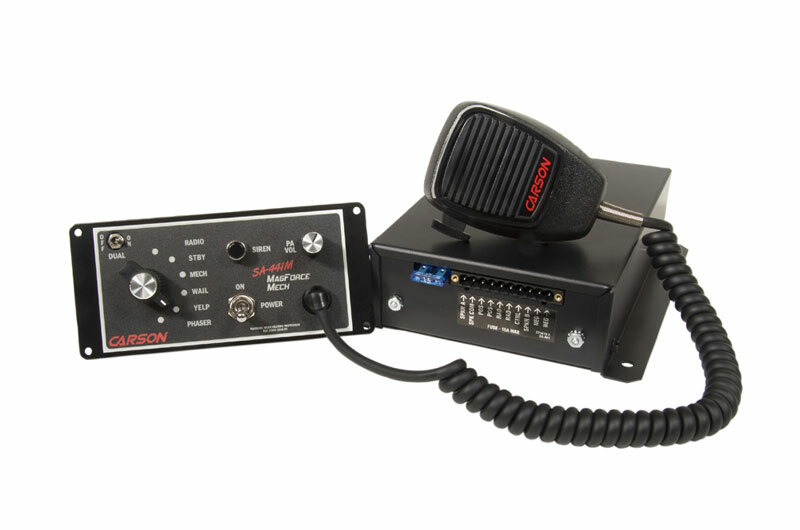 Designed for either console or remote operation, they deliver Carson dependability with the “Big Engine” sound that makes drivers pull over. The SA-400M Classic Mechanical siren is aptly named. Building on the foundation of the “industry standard” SA-400 Classic, this next generation siren combines the rugged dependability of its predecessor with a classic Mechanical Tone, powerful new Carson “Stutter” Air Horn and distinctive silver look. The result…a premium siren that effectively clears intersections by delivering that “Big Engine” sound that makes drivers instinctively pull over. 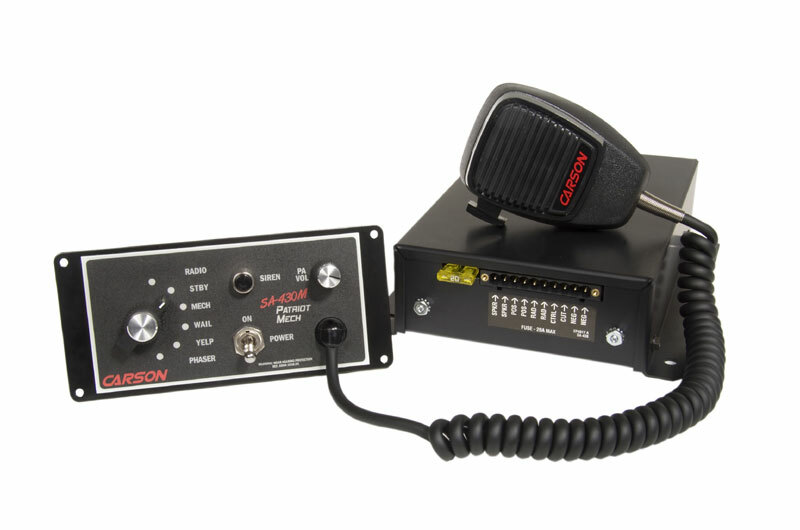 The SA-430M Patriot Mechanical remote siren is small in stature, but big in traffic clearing power! 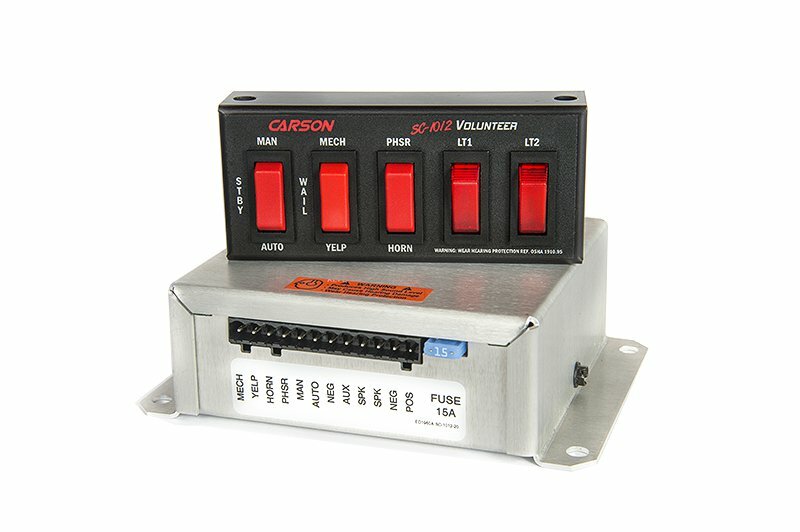 This truly unique siren offers the versatility of a compact, easy-to-install, flush mount control head with the strength of the new Carson replica “Stutter” Air Horn and dedicated Mechanical siren tone. The SA-441M MagForce Mechanical takes warning sound performance to the next level by combining a classic Mechanical Tone and new Carson “Stutter” Air Horn with the power of an independent 2 channel, 200 watt amplifier for maximum clearing output. The dual tone feature of this siren incorporates our popular selection of siren tones and new Mechanical tone into alternating sweeps which gives the perception of 2 sirens operating at the same time. This shockwave of sound penetrates even the most sound resistant vehicles on the road today. 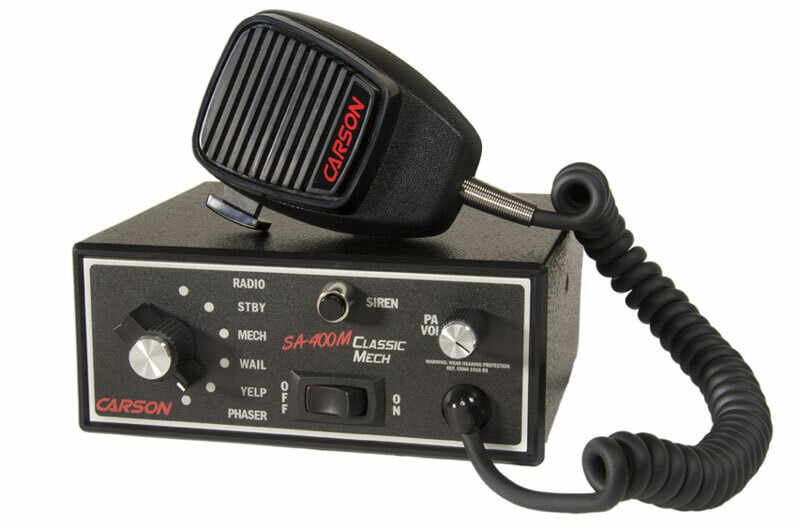 Introducing the new SA-500M Cruiser Mechanical siren…the smallest full featured 100/200 watt Mechanical tone siren on the market today! 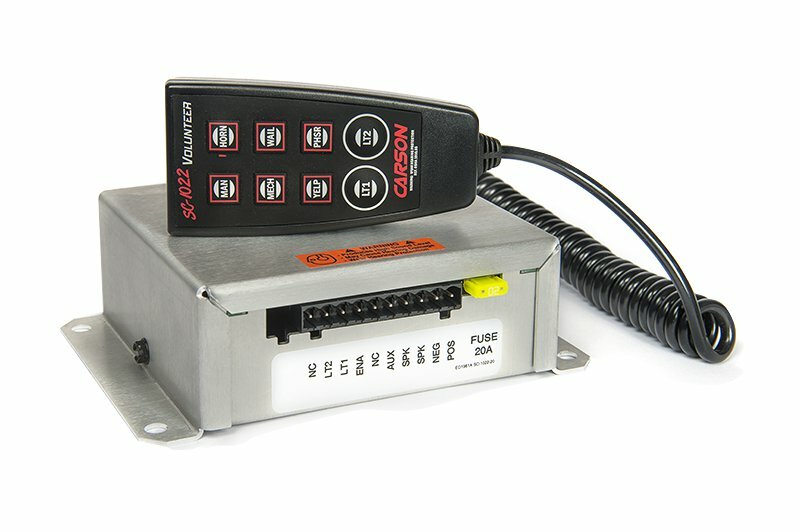 At only 2 1/8″ high, this rugged console mount model is ideally designed to overcome the space constraint challenges of today’s heavily equipped emergency vehicles. SC-1012 Volunteer 100-watt remote siren with light controls was designed with the volunteer firefighter in mind offering complete versatility. This unit gives you flexibility in the placement of the remote switch panel and amplifier. The SC-1022 Volunteer hand-held remote 100-watt siren with light controls all in the palm of your hand, ideal for the volunteer that wants the siren out of his way when not in use. 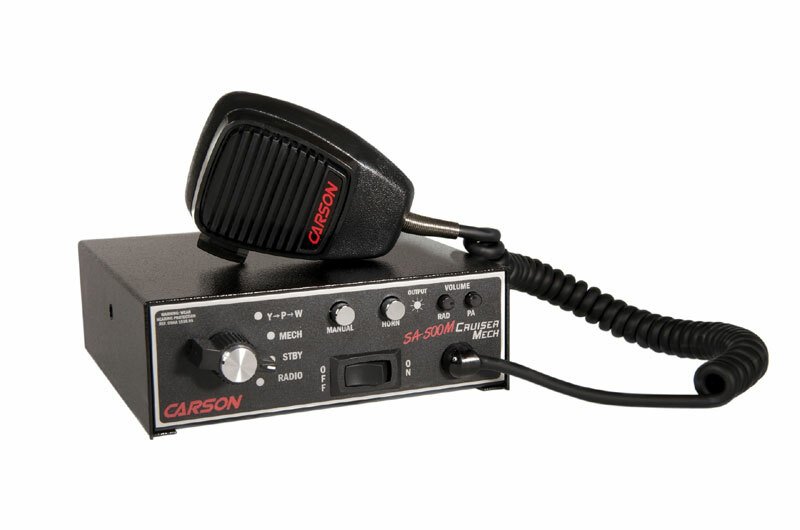 NOTE: All Carson sirens are intended for use by authorized personnel only. It is the user’s responsibility to ensure they understand and operate this emergency warning device in compliance with all applicable city, state and federal laws and regulations. Serving Alabama, Alaska, Arizona, Arkansas, California, Colorado, Connecticut, Delaware, Florida, Georgia, Hawaii, Idaho, Illinois, Indiana, Iowa, Kansas, Kentucky, Louisiana, Maine, Maryland, Massachusetts, Michigan, Minnesota, Mississippi, Missouri, Montana, Nebraska, Nevada, New Hampshire, New Jersey, New Mexico, New York, North Carolina, North Dakota, Ohio, Oklahoma, Oregon, Pennsylvania, Rhode Island, South Carolina, South Dakota, Tennessee, Texas, Utah, Vermont, Virginia, Washington, West Virginia, Wisconsin, Wyoming, United States, Australia, Canada, England, UK, Puerto Rico, Costa Rica, Russia, Trinidad, Singapore, and Thailand. © 2019 Carson Manufacturing Company, Inc. All Rights Reserved.